UPDATE (May 16): The MinXSS CubeSat successfully deployed from the International Space Station at 4:05:26 MDT this morning. The team has been busy with commissioning activities and assessing the status of the satellite. For more updates, see: http://lasp.colorado.edu/home/minxss. 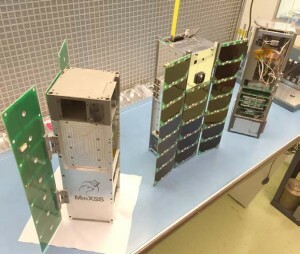 The NASA-funded MinXSS, designed, built, and operated by University of Colorado Boulder students and faculty at LASP and CU-Boulder’s Aerospace Engineering Sciences Department (AES), will operate in Earth orbit for up to 12 months. The CubeSat will be deployed from the ISS via a special deployer designed by NanoRacks LLC. To keep itself oriented toward the sun correctly, the MinXSS will incorporate an XACT attitude determination and control system built by Blue Canyon Technologies, a Boulder, Colorado-based aerospace company. MinXSS data will help us understand the physics behind solar flares. The soft X-rays carry information about the temperature, density, and chemical composition of material in the sun’s atmosphere, allowing scientists to trace how events like flares and other processes heat the surrounding material in the sun’s atmosphere—processes that are still being debated among solar scientists. “We’re excited to see MinXSS begin its mission and are expecting a smooth deployment on Monday,” said James Mason, a graduate researcher at LASP and MinXSS co-investigator. CubeSats are a new, low-cost tool for space science missions. Instead of the traditional space science missions that carry a significant number of custom-built, state-of-the-art instruments, CubeSats are designed to take narrowly targeted scientific observations, with only a few instruments, often built from off-the-shelf components. MinXSS, for example, uses a commercially purchased X-ray spectrometer for a detector and an extendable tape measure as a radio antenna. Over 40 CU-Boulder students, including undergraduates, worked on the MinXSS.